All prices subject to best offer and freight at buyers cost. The items are located in Orlando and Titusville, Florida. 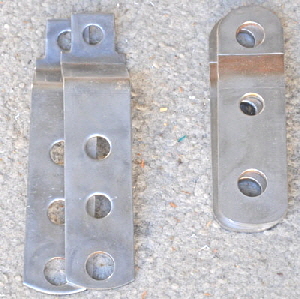 Doors do not have latching mechanisms, either spring latch or simple push pin will fit. Frames have holes where the screws came out suitable for 3/8” plugs. 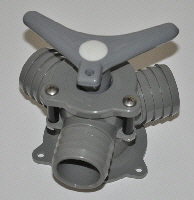 Sea-lect three way diverter valve, 1 1/2” pipes. Never used, still in original box with instructions. $65 in West Marine. Stainless steel Shakespeare TV antenna bracket with 1” plastic threaded insert. 13.5 inches long along the top. 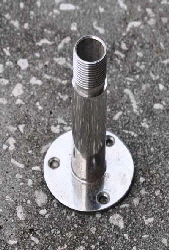 Flanges are easily bent to match mast shape. The supports are aluminum 26” high with 3�” diameter legs into locking top and bottom collars. The legs could be lowered if there is room beneath the bottom collar. These supports fit either table and I will sell them with a table or separately. Spray painted brown $80.00 the pair. Two 35’0” lengths of 5/16” 1x19 stainless rigging wire. 5/8” eyes and 5/8” Toggles on 10” turnbuckles. 1/2” threads in the turnbuckles. Clean condition. Four 26’0” lengths of 5/16 1x19 rigging wire with 5/8” stud and 5/8” eye. 6 drain pipes, Bronze fittings 1 1/2” pipes. Ideal for cockpit, deck or hull side drainage. Four beautiful chrome rigging tangs. 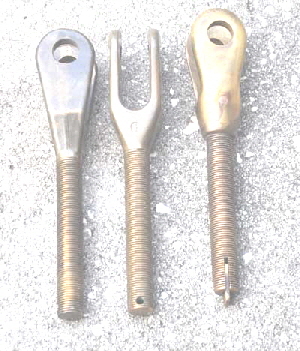 Right hand thread (top of turnbuckle), 5/8” thread and clevis hole. 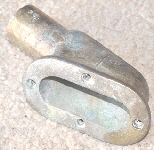 Bottom end of a Harken, Mk3 furler. 3/4” left hand thread and toggle. TV dish or Ariel bracket. Polished stainless steel. The two with three 5/8” holes are made of 3/16” thick stainless. They are 5�” long and 1 9/16” wide. They have a 5/8” offset (kink) which isn’t easy to see on the photo. 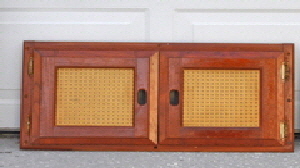 The plates with four holes are 5/32” thick, 7” long x 1 9/16” wide. These also have an offset of about 1�”. They are all clean stainless, with no rust marks.